Editorial: Who’s the RN? : Identifying nurses simply by the patch. Establishing the identity of the nurse has been a contentious issue since Florence Nightingale sought to change the practice and image of nurses in England in the 1800s-an image Charles Dickens caricatured to satiric effect with the slovenly, ginnipping buffoon of a nurse Sairey Gamp in his 1843 novel Martin Chuzzlewit. To counter that image, what nurses wore became as important as what they did. FIGURE. Nurses are no longer distinguishable from many health care workers. The woman in white, that 1950s stereotype in white cap, dress, and shoes, has prevailed as the media icon of American nursing, although she has long since left contemporary practice. Nurses in this country began shedding their white uniforms in the 1960s as part of the anticonformist movement, and the clear identity of the RN was blurred. Ever since, patients have complained that nurses are unrecognizable to them. And even nurses debate what nurses ought to wear. For example, tunics festooned with flowers and cartoon Teddy bears, worn by nurses and nonnurses, seem "unprofessional" to some nurses when worn outside of pediatrics. Those critics may be right; journalist Suzanne Gordon has noted that the ways nurses present themselves to patients shape public views of the profession. Artists Mark Dion and J. Morgan Puett extended the debate over nurses' uniforms and identity through their exhibition RN: The Past, Present, and Future of the Nurses' Uniform, on view in Philadelphia at the Fabric Workshop and Museum from October 2003 until February 2004. In collaboration with the University of Pennsylvania's Center for the Study of the History of Nursing (of which Karen Buhler-Wilkerson is director), Dion and Puett documented the societal trends that have shaped what nurses wear while at work. The single most dramatic response, from nurses and others, was that nurses are no longer distinguishable from many health care workers. This month, AJN has adapted part of the exhibition's catalog and published it with photographs of uniforms both historic and futuristic (see page 40). Read the article, and let us know what you think about nursing's uniform dilemma. Prior to the exhibit, the artists surveyed nurses: what elements would the "ideal" nursing uniform contain? They incorporated those elements into their own design of the ideal uniform, which they displayed. In addition, the artists designed an "RN" logo for the exhibition as well as an embroidered "RN" patch distributed at the museum (and which we display this month on our cover). One nurse who attended recognized an opportunity to assert her identity and sewed the red-and-white patches on her lab coats. We are asking uniform manufacturers to make these patches available on uniforms they sell to nurses-whether scrubs, whites, or lab coats. AJN will publish the names of uniform manufacturers that do so. Hospitals, long-term care facilities, and home care and other organizations can purchase patches in bulk for their employees. Quantities of 5,000 or more can be ordered from Valley Products Company: (800) 451-8874 or valpro@clothlabels.com. What a great gift for Nurse's Week celebrations. 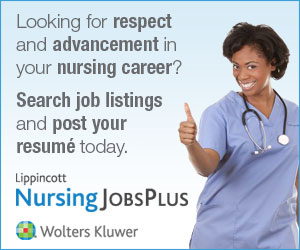 We believe this could be a simple yet elegant solution to nursing's identity crisis. (Perhaps a similar patch for LPNs could be useful as well.) Help us take it from the grassroots to a national platform: apply the "RN" patch to your scrubs or lab coats, and urge your colleagues to do the same.